Sailors hold off Vineyarders in close battle between old rivals. Sometimes the puck just doesn’t go in the net. 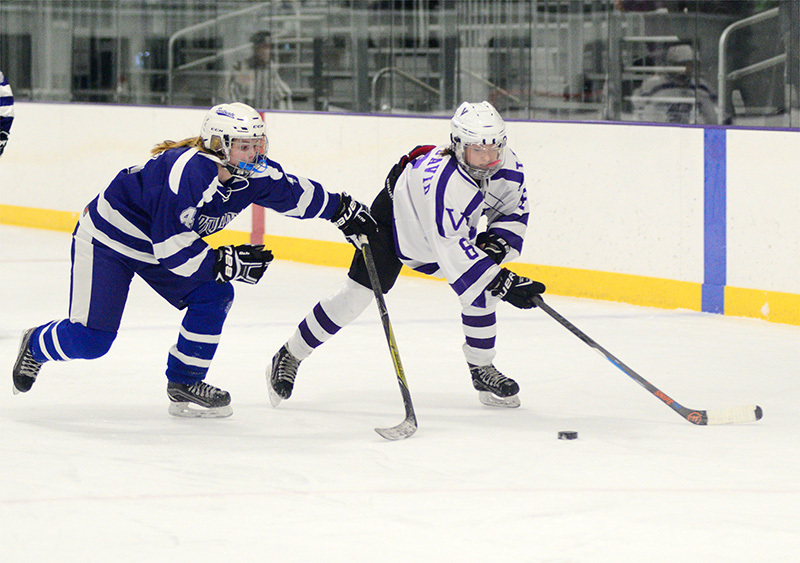 The MVRHS girls hockey team had one of those games against longtime rival Scituate in a 2-0 loss to the Sailors on Thursday afternoon at the MV Ice Arena. 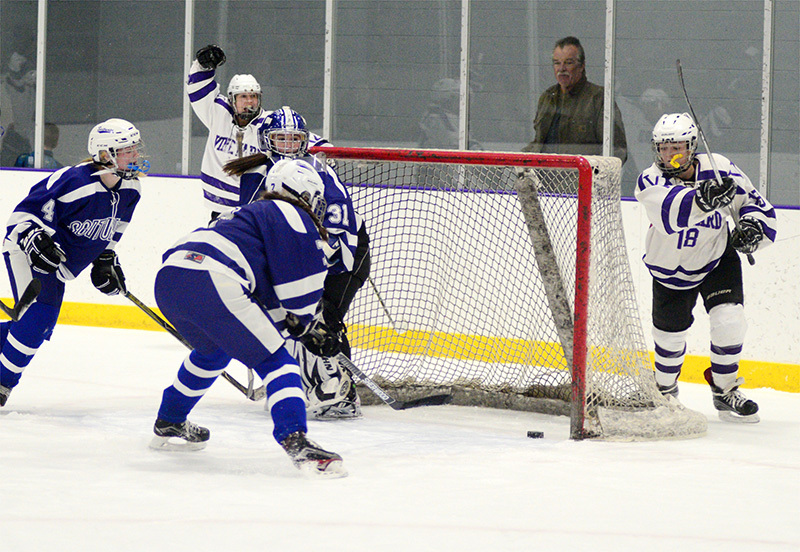 Christine Oar scored both goals for the Sailors, one at 4:31 of the first period from Madi Richman and Elliette Leahy, and another 6:35 into the second stanza from Richman. Following the second Scituate goal, Vineyard Coach John Fiorito called a timeout and gave an impassioned speech on the home bench. The coach’s speech lit a fire under the Vineyarders, who tilted the ice toward the Scituate goal for the remainder of the period. 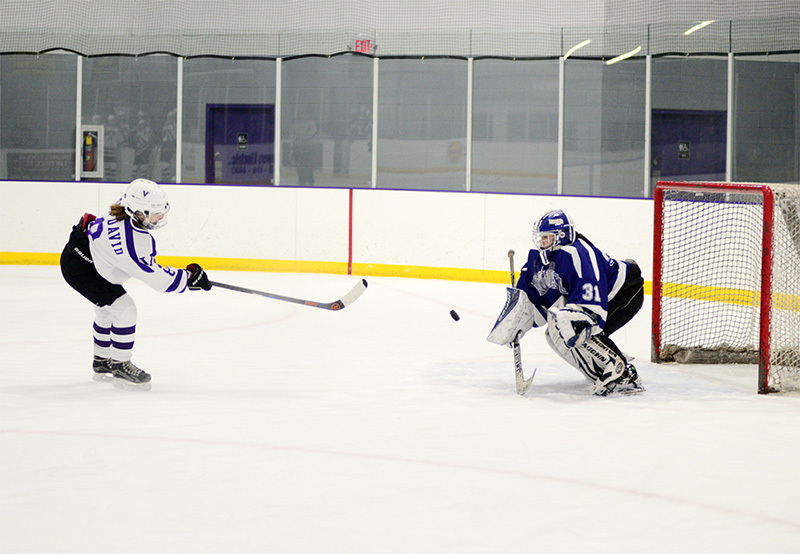 Ava BenDavid drew a penalty shot, awarded after she was hauled down at the blueline to prevent a breakaway, and snapped a wrister from the slot, but Scituate goalie Molly Walsh made the save with her blocker. Meghan Sonia followed with two scoring bids, and hit the post twice. On the first attempt, the puck bounced off the right post and wobbled to a stop on the goal line. 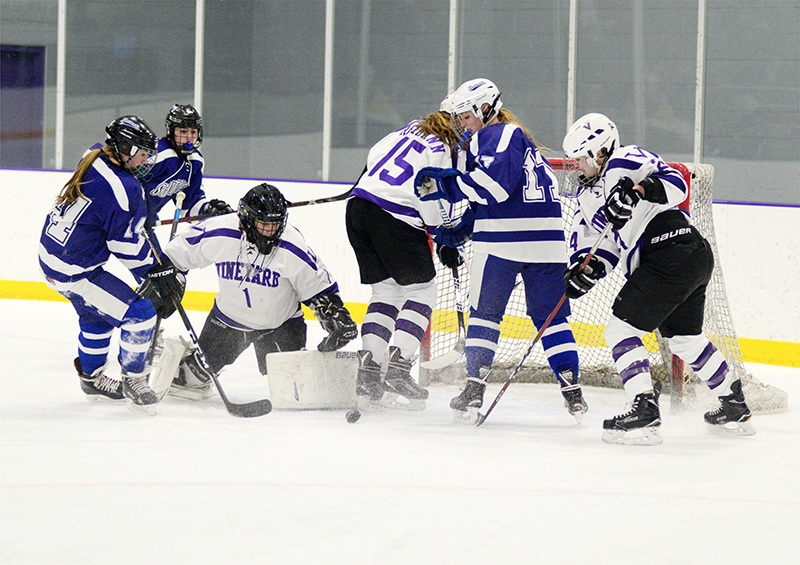 The Vineyarders started to celebrate, but the puck did not cross the line and the score remained 2-0 in the Sailors’ favor. In the third period, the Vineyarders had one more golden opportunity to get on the board, but Ava BenDavid’s wrister from the high slot clanged off the crossbar. From there, Vineyard legs started to tire and the Sailors ratcheted up the pressure. Enter Vineyard goalie Amelia Simmons, who responded with six outstanding saves, one with her blocker and the others with her pads. The Vineyarders will again try to notch that elusive first win of the season, at home on Saturday against Nauset. The puck drops at 1 pm.